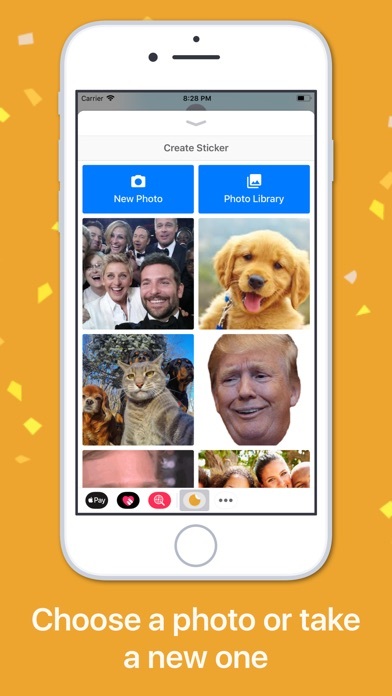 Create unlimited fun stickers of yourself, your pets, friends, or literally anything you can think of! Stand out from your friends with 100% customizable stickers using photos from your photo library. 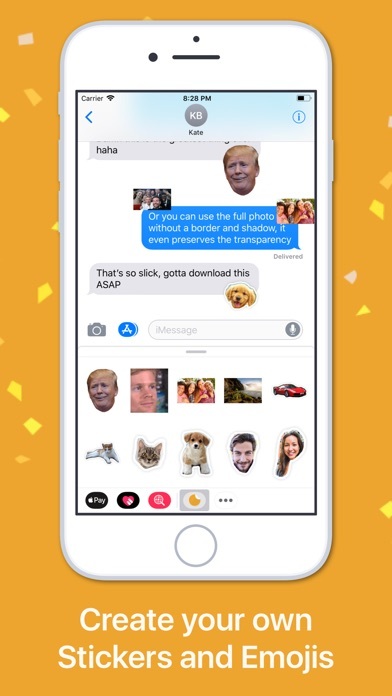 Send alone or attach to any speech bubble or photo in iMessage. --- HOW DOES IT WORK Choose a photo from your library or take a new one, before tracing the shape of your sticker. Borders and shadows are added automatically for that professional realistic sticker look! If you prefer, you can also use full photos as stickers. This is helpful if you customize your stickers in another app, such as Photoshop, before wanting to use them in iMessage. All stickers preserve their transparency! --- FEATURES • Create unlimited custom stickers! 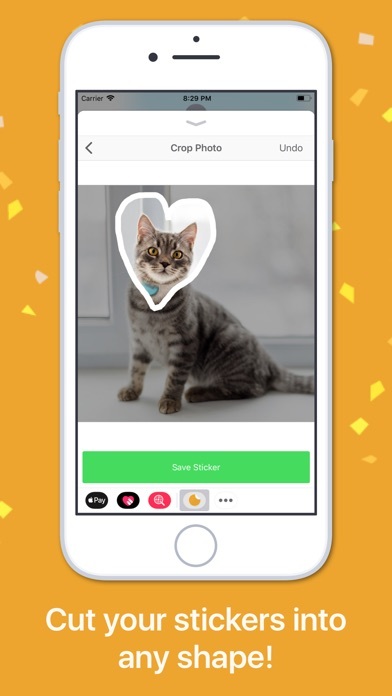 • Cut a professional looking sticker straight in the app! • Use the entire image as a sticker! • Preserves image transparency! • Your stickers can be seen by anyone with iMessage! 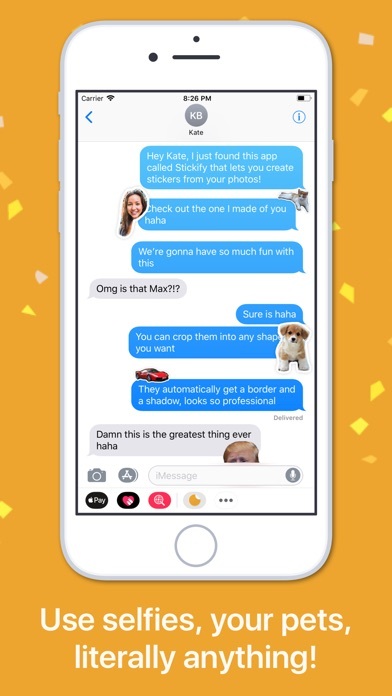 • Manage your sticker library straight from iMessage! --- QUESTIONS If you have any questions, feel free to reach me directly at aleksander@alekapps.xyz. I'm a solo developer, so if you enjoy Stickify, please leave a review in the App Store. It'd mean a lot to me! I don’t mind not being able to precision crop, but can you make it so the stickers can be bigger? Sometimes they are extremely small, so it would be very useful. Great app. Changed from from 4 to 5 stars because the developer addressed my one issue with the app. This is a pretty good app, especially if you don't want to seriously get into sticker making but still want your own personal stickers. Although it does get annoying that you can't delete the stickers, so maybe work on that for the next update? Anyways, it's still a good app and fun to play around with. Edited* I only got this for one reason though. EDIT: While I had a low selection of stickers at the start, I did not notice this problem early on because of it. But now that my sticker selection has grown, I discovered one MASSIVE GLARING FLAW: The uploaded stickers can only show/display a few. The old ones get purged/deleted as you upload new ones. This is a no no. I’m changing my review to 2 stars because of it. Please fix this. I would like to upload and keep ALL the stickers that I upload. Old review: I’m honestly in love with the fact that I can upload my own stickers as-is with the transparency of the image intact. I think this is the only app does this so far from what I’ve searched. Other apps force you to put a border when uploading your own stickers, but this one doesn’t. The main feature is the ‘auto-cut-to-sticker’ function of this app, which I don’t use too much. I mostly just cut the images on an image editing software on my computer and transport them onto my phone then onto this app. This app basically preserves my edits and turns them into stickers. All the other sicker creators from selfies or images are too complex, filled with crappy filters and features, or just plain buggy. This app works and is simple. Here is my 5-Star wish list: 1. Steal the tracing touch-up UX from “Imoji”. Instead of having to retrace if you mess up they let you push the traced line around to adjust. Wayyyyy less frustrating. 2. Delete stickers. Maybe there is a way to do this but I couldn’t find it. 3. Make stickers bigger. Imoji by default makes saved stickers about 2X the size. It’s easier to pinch-to-zoom down vs. up so please make the default bigger. 4. Zoom in when tracing. 5. Better album selector. Crazy slow to scroll back chronologically through 1000s of photos. Worth the 99c Id say because it’s simple and works. I’ll be keeping this app on my phone when I deleted all the others despite not having 1 and 2 above. but how do i delete stickers? I love this app but it has issues with functionality and execution.. •Can’t delete stickers. This fact deters me from using sometimes. It’d be amazing if you could “favorite” a sticker too. •No precision AT ALL when cropping. We’re dealing with stickers for iMessage; xacto precision isn’t required but a little bit more than butter knife precision would be great. •Need ability to continue editing/undo, because lifting your finger finalizes the crop and you can’t see around your finger to make sure the sticker still has both eyeballs.. •Photo selector needs MAJOR love.. I have 38,000 photos.. nuf said. Great app with tons of potential and looking forward to updates! looking forward to the updates described in response to previous comments. until the selection tool has access to the Photos navigation, this is essentially unusable for my purposes: it’s not really practical to scroll through 20k+ photos in search of the desired image. will update my rating as the app evolves. thanks. Dl'ed from store recommended by ApAdvice. Says installed from store but doesn't show up any where on phone. Two emails to contact no reply. The concept is awesome! I was able to create one sticker but the app failed with each additional one I tried. I'm sure it is a bug and will be fixed eventually, but as of right now, the app isn't working on my device.